This article is about the joke that Google played on Google users before April Fools Day. It was really funny. 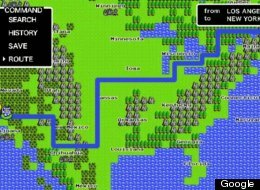 Google literaly released an 8-bit version of their Google Maps function. It came with all of the original functions of Google Maps, but as an 8-bit retro game. Both the street view and destination tools were very interesting in 8-bit pixels. To access Google Maps Quest, all you had to do was go onto google maps and click the ‘Quest’ button on the top right corner of the screen. It comes in it’s own NES cartridge for your NES. The first NES cartridge to be released for 18 years! It even came with old school an 8-bit video game theme that sounded a lot like the theme from Dragon Quest for NES. The best part was Google announced that they are working on an 8-bit version for GBA. This pratical joke was very clever and really had me going, considering the only thing you had to do to access Google Maps Quest, was to go onto google maps and click the ‘Quest’ button on the top right corner of the screen.